After 35 years my old MERCURY 20 HP outboard had finally seen it’s last day. After thousands of hours on the river and great lakes it was time for a new engine. After talking to fellow DWF member Tom at ANGLERS MARINE in Taylor Michigan I purchased a new 25 HP EVINRUDE E-Tech. The crew at ANGLERS MARINE hooked it all up and bolted it down to my old CRESTLINER last Friday so I decided to take it out and run it the next day. Since the White bass had moved in I decided to wait until the evening. Besides I needed to time get used to a new engine and all the little bells and whistles that came with it. That and I needed to mount my SCHALLER AUTOMATIC TROLLING REEL, my EAGLE depth finder and LOWRANCE GPS back onto my boat. I did get out a little bit before dark. I wanted some time to run around on the river and get acquainted with my new toy. I have never owned an electric start engine before so just pushing a button was a pleasant change. I have to admit I really like my E-TECH. I have nothing against my MERCURY but I really wore that engine out. I just need to get used to the sound, or lack there of, of the E-TECH. I have trolled for so many years with the MERC that I could tell by the sound of the engine when the RPM’s were just right for the speed I wanted. Need to spend a few hours now and learn that sound again. Nice thing about the E-TECH is that it has a toggle switch that will increase or decrease the RPM’s by 100 with just a push. That’s a nice little feature to have. I can give the lures a little push every once and awhile to see if I can trigger a strike. OK, enough love for the E-TECH, time for the fishing results. I set lines around 7:30 pm. There were a few other Handliners out but it was still early. The Tr-Hull nave was in full force along the Gibraltar/Trenton side of the river. Not a good omen. I put on a #11 COPPER CRAZY TIGER and a #9 SPRING VALLEY SPECIAL II from WWW.DOWNRIVERTACKLE.COM. I also put on a SPIKE SPOON (He will be missed) in a RILEY SPECIAL pattern. I figured I was going to get a few White/Silver Bass but I was expecting to pick up an occasional walleye until it got dark. Turns out I was pretty right in my prediction. I just wasn’t expecting how it would happen. Most of the bass came on Jim’s Holographic lures. Pretty much 95% of the bass I caught came on those lures. I expected the spoon to catch most of them but I only caught 2. 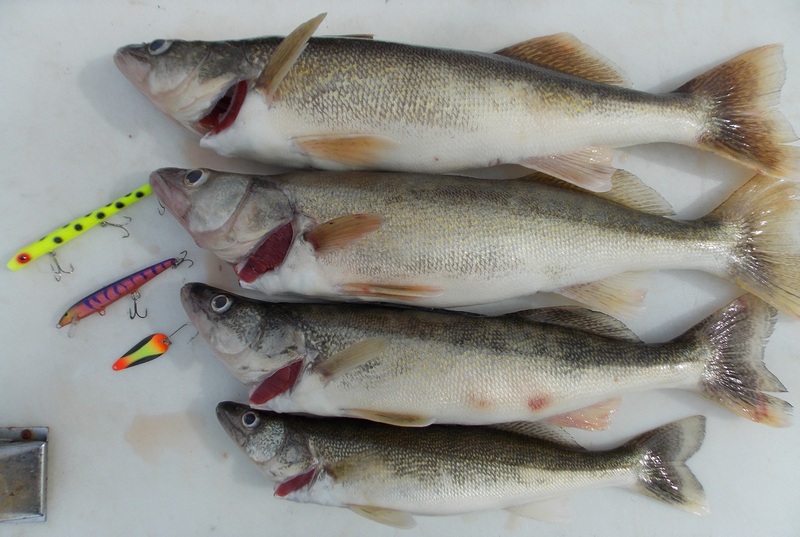 My first walleye came on the spoon and the walleye that was 14 15/16 inches came on the #11 CCT. Even after it got dark I was still catching the bass on the RAPALA’S. Eventually I got fed up (not hard to do when it comes to those rotten little things) and I swapped out the RAPALA’S and replaced them with some NIGHT STALKER Pencil Plugs. I have a lot of wooden pp’s but the eyelet is set to far back and the crank bait snaps that I use can’t get through the eyelet. The NIGHT STALKERS are plastic and the eyelet is far enough forward so I could attach them with the crank bait snap. 3 walleye came on the 40 foot lead and a chartreuse with black dots NIGHT STALKER. I also hooked in to something big but I never got it in. Once I got my hand on the leader I could hear it rolling and splashing way behind the boat. I knew this wasn’t going to last long and I tried to throttle down some to relieve the pressure but it was to late. I fished until about 10:30 pm but the wind was picking up and it was getting cold so I headed in. I had 4 in the cooler and sometimes 1 short of a limit is no big deal. The best thing was that I never caught a single white bass on a pencil plug. Don’t know if that will hold true during the peak of the run but I will find out. So I ended up with 4 in the box, 1 throwback and lost probably a Muskie. Surface temps are at 53.5 degrees and the water is very clear, over 2 feet of visibility. NE wind with a partly cloudy sky. Back to a night fishery again, especially with the you know what’s in town.